Where do you get your sense of fashion and style? From my mother who was a wedding gown designer and fashion critic. I was her mannequin for flower girl dresses because she didn't have one and so over the years I started to understand fashion and placement of juxtapositions to made the eye admire. What's your definition of fashion and how does it collate with your position as a CEO? Fashion reveals its self to an eye that is closely watching. Fashion is part of human rights. Fashion needs human rights. You need to be free to express yourself. What’s your approach to getting dressed everyday? I get dressed based on how I feel. Mr. Kayongo, what's your heritage and what brought you to the United States? I am Ugandan. I came to the United States to go to school. What has been your most challenging obstacle you’ve had to overcome? Fear to vacate my comfort zone in my career to opt for risk. At first I didn't trust myself to dream and act upon my dream. I thought my skills were inapt. But now I realize risk-takers like everyone fear to start but they gather the gumption to start and don't fret to fail. When you courageously start, the universe provides helpers and you should trust in yourself so the helpers can gain confidence as they help you. What was your driving force behind Global Soap Project? I spent ten years perfecting my skills and talents before I went out to chase after my dream of building Global Soap. My skills and talents at the end of the day drove me into success. But at the end of the day the idea of hotels throwing away 800 million bars of soap in juxtaposition of the two million kids that die every year due to poor hygiene and sanitation were the reason I set off on this noble journey. How challenging was it to get the hotels and other organizations to partner with you? It wasn't because they understood the power of our mission. In particular Hilton Corporation got it because they gave me the angel money to build my factory. What does it take to be great at leader? The characteristics of a great leader are endless but a key one that I love comes from an acronym that I coiled a while ago called SELF. It stands for Service, Education, Leader and faith. Great leaders start with a sense of service. Then with a teutonic thoroughness educates him/herself on the issue they want to champion and then determine what sort leader they are and lastly develop a sense of faith and belief in something more noble then they are to aspire for a legacy through their work. A leader who does have faith in themselves or others is a leader who dictates and develops authoritarian methods. Hence a great leader has a great sense of SELF. What was the best advise that someone has told you? The best advice was for me to have faith and be patient in all I do. Eventually things turn around in your favor. You have many accolades but what has been your biggest accomplishment? So far my biggest accomplishment has been raising my kids to become good humans. I pray that by the time they get out of my house that I will gift the world with kids that respect the other and understand what Daddy fought for all his life and that is Civil and Human rights for all. What's your motivation to become a humanitarian and work in public service? My experience as a former refugee is the reason behind my desire to dedicate my life into a humanitarian. Why? because we still have refugees in the world who innocently afflict from the reprobate leadership of waring countries around the world. 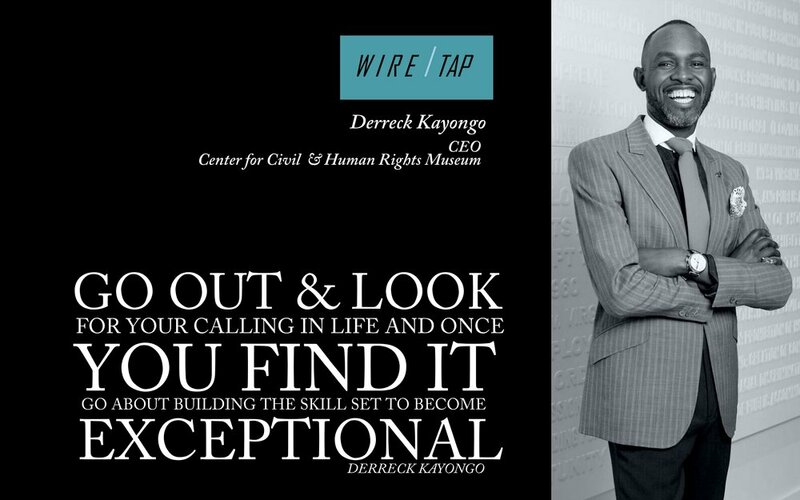 Being named as the CEO of the Civil Human Rights Organization, what does that mean to you? It means that I did all the right things to get to this place of recognition. But it also means that I have to do the best I have ever done to get the world to understand the power of the Center in helping fend off the abuses of human and civil rights. I will be the champion of the CENTER as the CEO more than everyone else because its future is the future of the world. What legacy would you like to leave? I want people to look back at my legacy and say on my epitaph that Derreck understood the power of serving others. Through that service he lived a fulfilled life and left monuments of courage through the Global Soap Project and his work at the Center of Civil and Human Rights.